this works just fine (gives 0 as output). my output is 8589934592, which is definitely wrong. This worked fine for FTN95 8.10. Interestingly, if foo is external (i.e. not defined within a CONTAINS scope) or if I define the pointer within the main PROGRAM, the problem does not seem to appear. This is definitely a bug (and also a regression to FTN95 8.10). 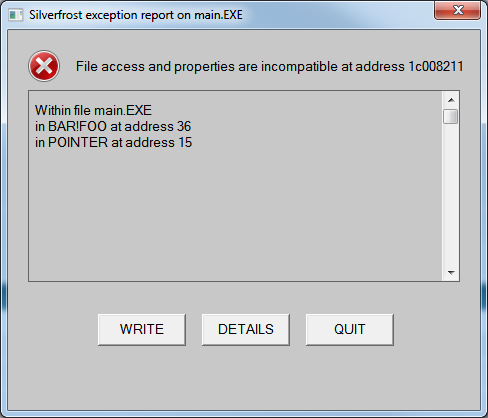 Same weird error message in 64 bit. However if I remove subroutine foo (which I am not using anyway), the program works fine again. Everything works fine in FTN 8.10. The same result is obtained with the current release (v8.30). I have made a note that this needs investigating. This has been fixed for the next release of FTN95. Anyone who needs this construction immediately should update to version 8.30 and then send me a message on this forum so that I can provide a link to a new FTN95.